Precision, quality and a more personalised approach to fitting contact lenses are the qualities that have come to define mark’ennovy. These same qualities have inspired our new packaging design. Five years ago, mark’ennovy updated their brand identity, bringing a similar look and feel to their product packaging. The new identity brought the mark’ennovy brand to the forefront as the provider of products, services and technical expertise to help eye care professionals offer their patients a more personalised contact lens experience. 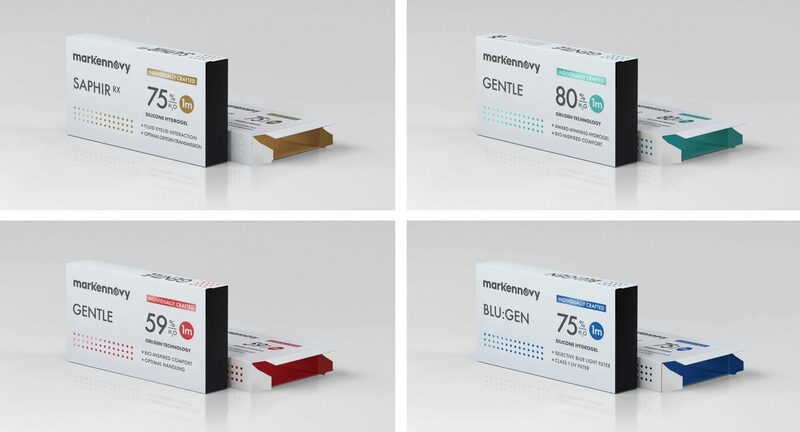 “Before 2013, each mark’ennovy product had its own brand identity, which we felt was diluting our efforts to strengthen the awareness for the mark’ennovy brand among contact lens fitters throughout Europe,” comments George Sarrouf, CEO and Chairman of mark’ennovy. Our updated packaging designs have been developed in the same vein. The Individually Crafted nature of our product portfolio is reflected in a clean layout, geometric shapes and the subtle shine of metallic inks, whilst a satin finish adds a soft touch to the packaging’s exterior, a detail that gives a nod to the comfort of soft contact lenses. The packs will also arrive with your patient’s name engraved, part of our Individually Yours campaign to drive patient awareness for the uniqueness of their eyes. The updated colour palette stays true to the current one with one exception: the introduction of a glimmering aquamarine for Gentle 80, a fresh new colour that helps distinguish the bio-inspired lens from its silicone hydrogel counterpart, Saphir Rx. mark’ennovy is expected to begin phasing in their new packaging as early as February 2019.